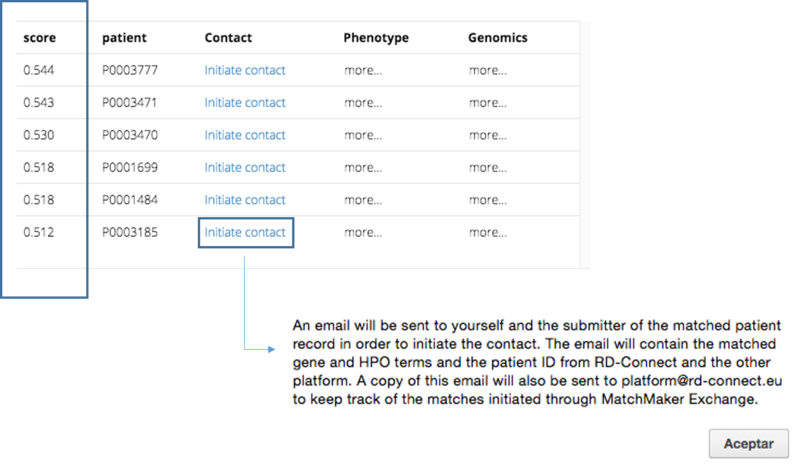 As part of the RD-Connect Genome-Phenome Analysis Platform, we will set up each of the associated projects with an account in the clinical database at PhenoTips. Users will be expected to enter the phenotypic data which has been collected for each of the participants, even unaffected individuals (who just need to have a note to say they are unaffected), whose samples are being sent for sequencing as part of the project. In order to do this you need to follow the instructions in this section. Once you have been verified and registered with RD-Connect, you will receive your username and password. Navigate to https://platform.rd-connect.eu/phenotips/ and log in with these credentials. The first time you log in, you can change your password to something more memorable. To do this, click on your name at the top right of the screen, select Preferences on the left hand menu and choose Change Password. Whenever you want to return to the starting page, click the PhenoTips logo in the top left corner of the screen. 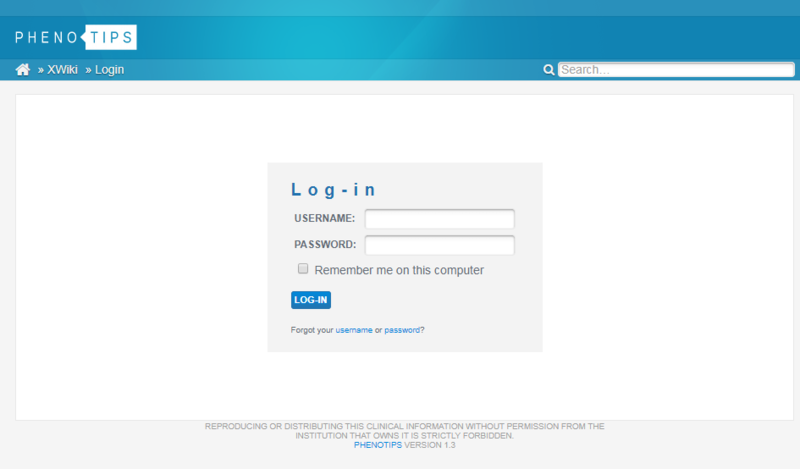 This takes you to the home page which acts as a dashboard for the various features of PhenoTips. Here you can see who is a member of each group and how many cases belong to each. This is important for when you come to share your data with others. Groups always have the format – (e.g. unew-horvath). Clicking on a group will open a new page with more details. This lists participant records you have already created. You can open a record by clicking on it, and also sort the records by the ID, creator or creation date. This lists participant records created by other users who have added you, or a group of which you are a member, as a collaborator. 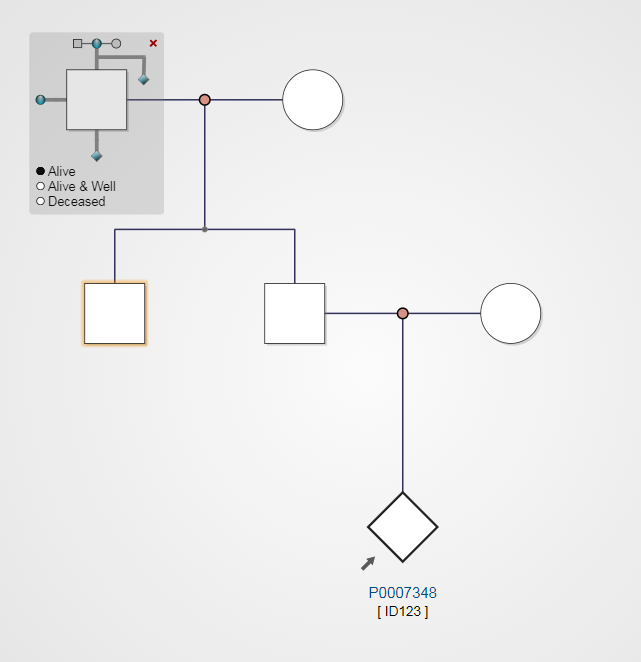 This lists Families that you have created using the Pedigree Editor. This will be covered later in the guide and is done when you create new participant records. Lists Families created by other users who have added you, or a group of which you are a member, as a collaborator. 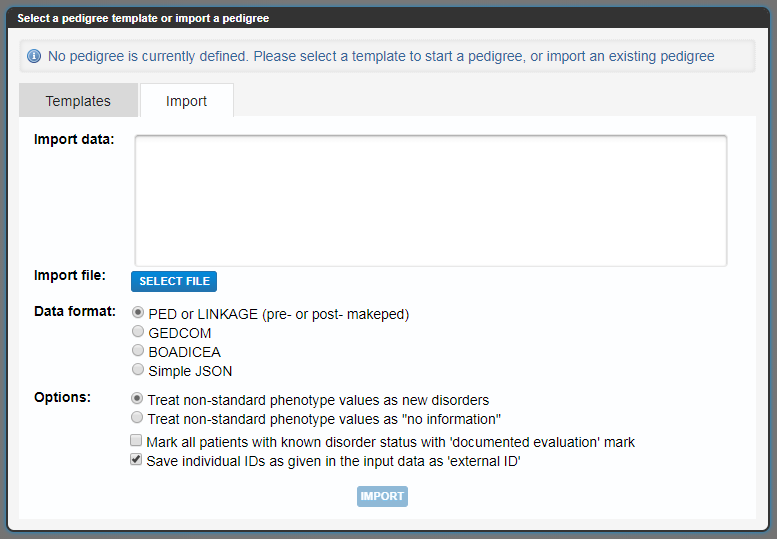 Option 1 (bulk upload) is only available for submissions of high number of patients whose phenotypes are already HPO, OMIM and/or ORDO encoded in a specific database or file. 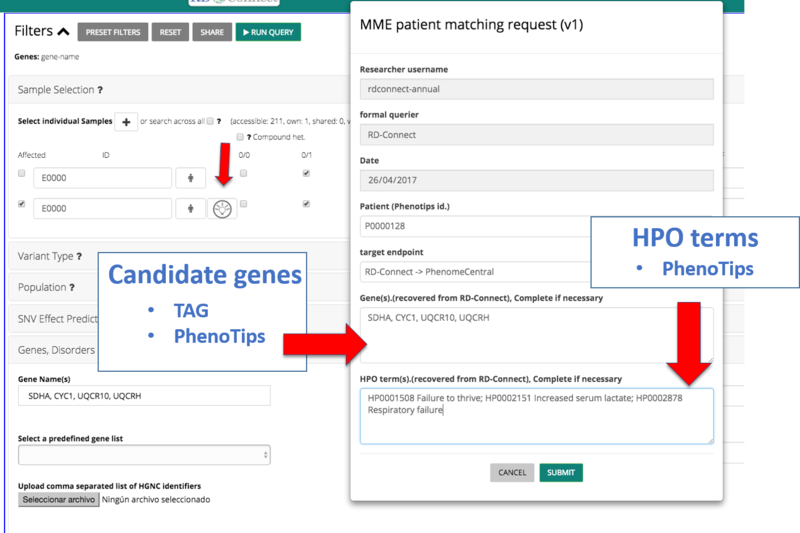 This option is only available for submissions of high number of patients whose phenotypes are already HPO, OMIM and/or ORDO encoded in a specific database or file. Contact platform@rd-connect.eu for any support during the process. You need to export the corresponding entries in a JSON format and send it to platform@rd-connect.eu. 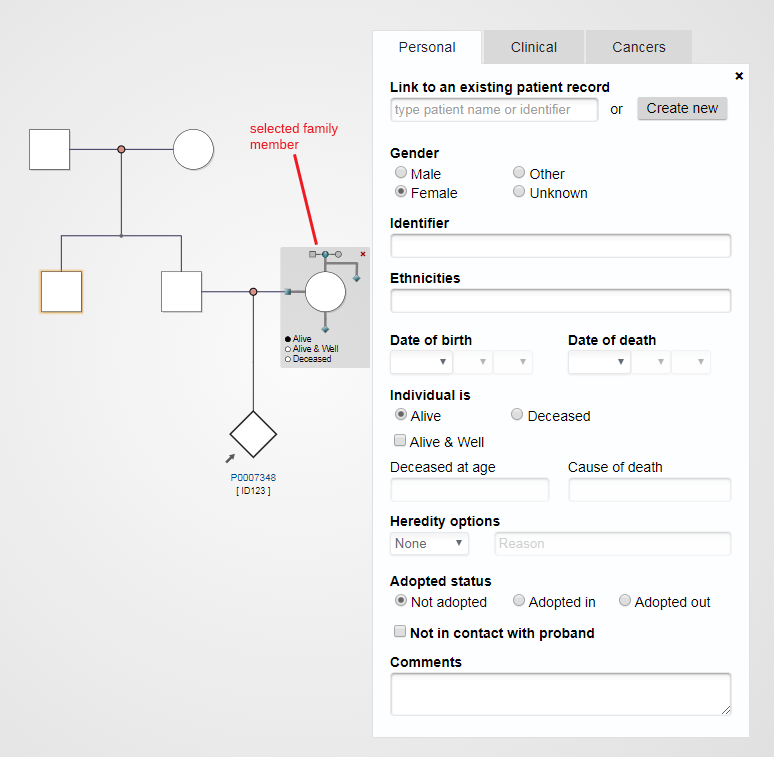 Include index cases and relatives from whom you will submit genomic data. The corresponding RD-Connect patient identifiers will be sent to you once the data is successfully uploaded to our system. 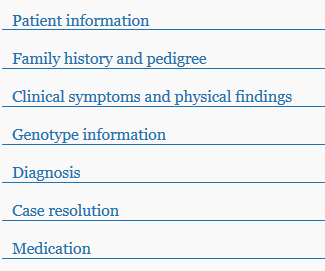 Include index cases and relatives from whom you will submit genomic data (one row per individual). Mandatory fields in red (this include a minimum of 5 HPO terms for index cases). Detailed description of each of the values requested can be found in line 2. Once you have completed the excel file, you just need to send it to platform@rd-connect.eu and we will convert the excel file to a JSON format and import it to our PhenoTips instance. The corresponding RD-Connect patient identifiers will be sent to you once the data is successfully uploaded to our system. Please note that after uploading the data to our system a quality control verification will be performed to ensure that minimum phenotypic requirments have been completed and additional information will be requested if missing. 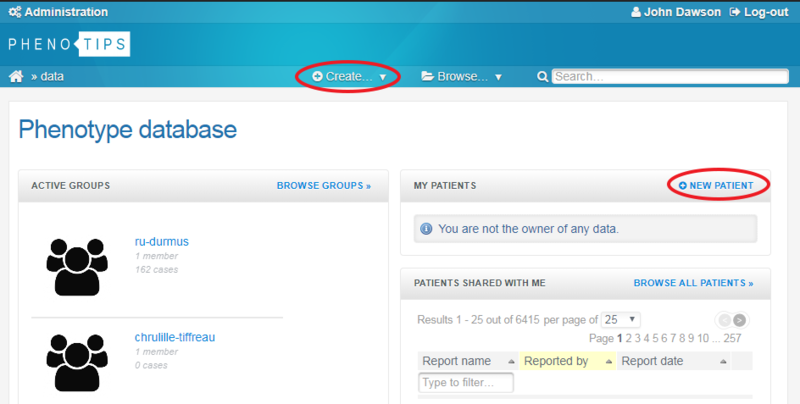 To enter new participant data you can either click on NEW PATIENT at the top of the MY PATIENTS window, or you can hover over the + Create… dropdown menu at the top of the screen and select New patient. We use the Human Phenotype Ontology (HPO) to record phenotypes for participants in order to match between cases. 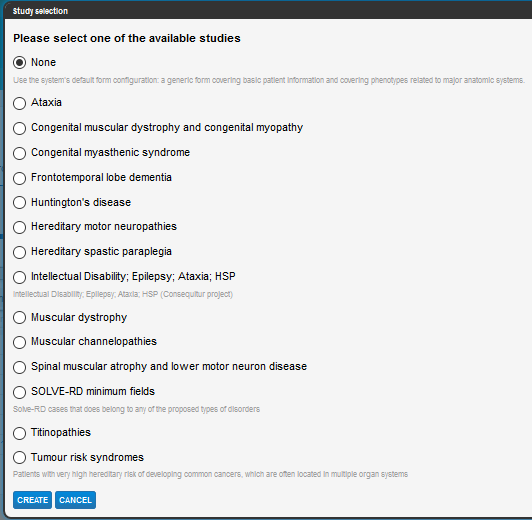 We have grouped some HPO terms that are relevant to particular diseases into Studies, so that if the record you are creating is relevant to one of the Study forms, you can select that and it will list the phenotypic terms appropriate for that case. 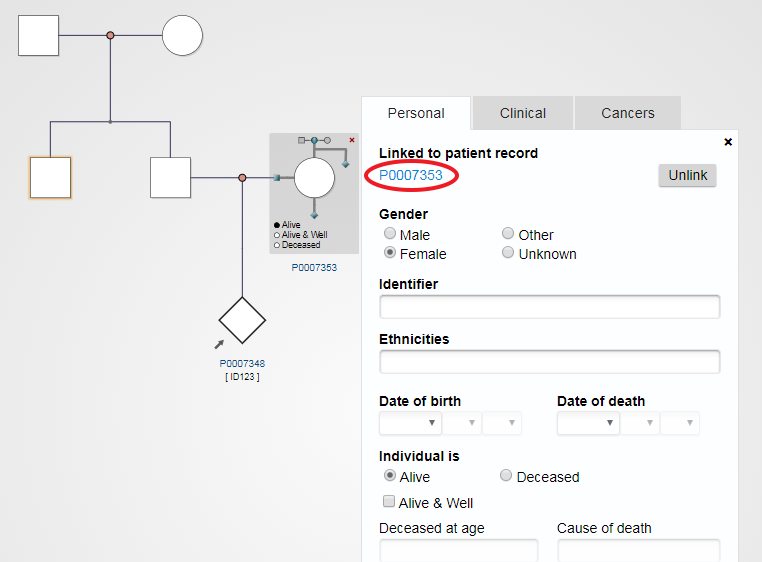 Select the disease (Study) form you wish to use, this will determine if the form will have sections specific to that disease, otherwise choose None or SOLVE-RD minimum fields (if the data you are submitting is part of this project), and click the Create button at the bottom of the window – a blank record will appear. Enter your external ID code for this patient record in the Identifier field. Also make a note of the PhenoTips ID (top left of the window) for your records so that you know which PhenoTips ID corresponds to which of your own IDs. Continue through the form entering the patient information as required. For some fields you can click the ? or ! icon for further information. Choose Y (affected) or N (unaffected) for Clinical status. This is mandatory so that we can differentiate between affected and unaffected individuals. Now work through the Inheritance, Progression and Onset data. Indented descriptions are subcategories of those above. If you click on the little ‘info’ icon, a definition will pop-up. Work through the rest of the form clicking on the headers to open out the sections of the form. 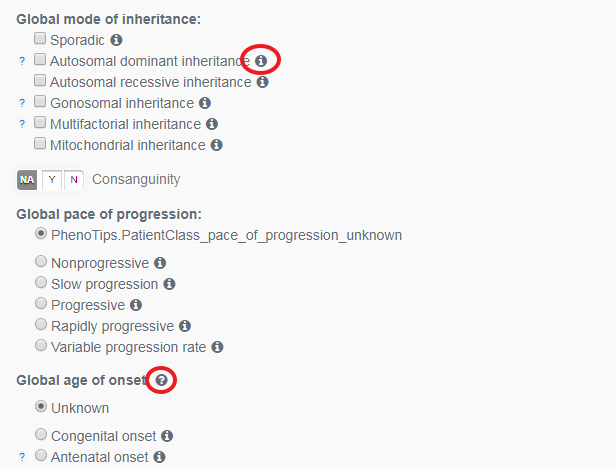 Where a triangle exists beside an observed phenotype, clicking on it will reveal sub-categories. Some of the sections may or may not be visible depending on the Study you selected. 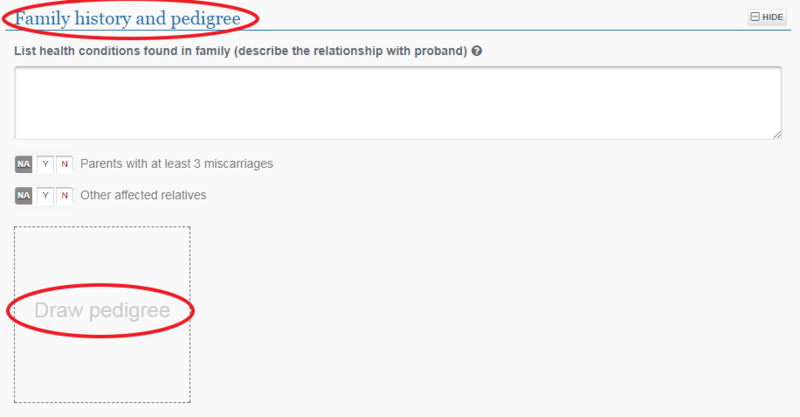 You must now enter the known relations of the participant by clicking on Draw pedigree. 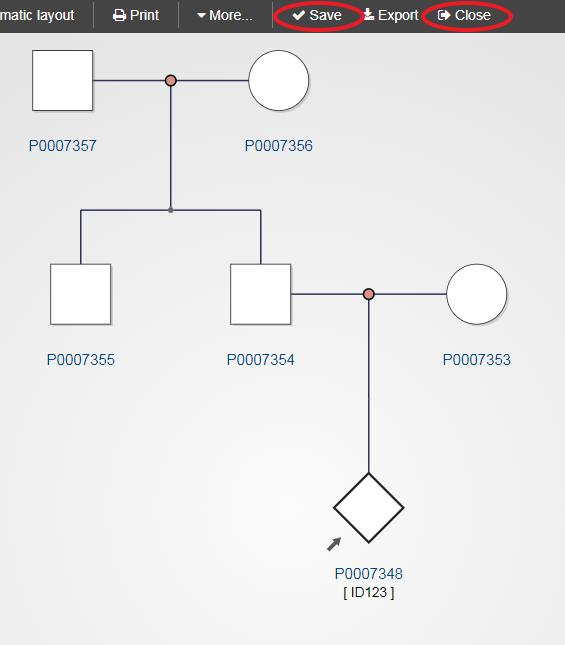 If you do not know of any of the relations, please create a pedigree anyway by using the first available template that pops up for a single individual (see below). This is important for us to monitor the number of index cases and families in the system to make it more effective. A window will pop up and you should select Create a new family, unless the family already exists in the system. 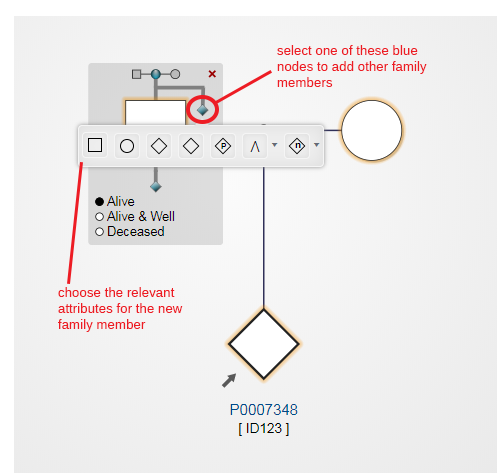 Usually this will be the record for the index case so you will be making a new family diagram by selecting “Create a new family”; if you are adding a new member to an existing family you will select “Add to an existing family” and enter the Family ID here. Select the most appropriate template for the family, or click on Import to pull in existing data if it is in one of the supported data formats. 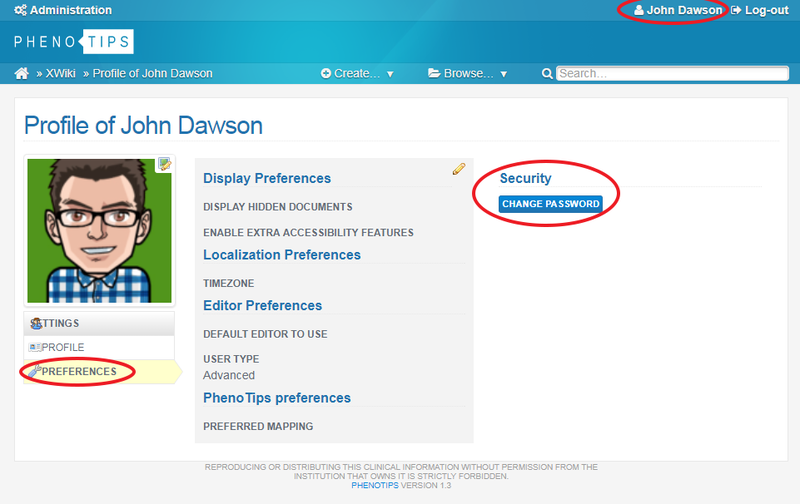 Next click on the PhenoTips ID (make a note of this for your records) and you will be taken to the new, blank record. Click Edit and fill in all the information for this record, making sure to click Save when done. 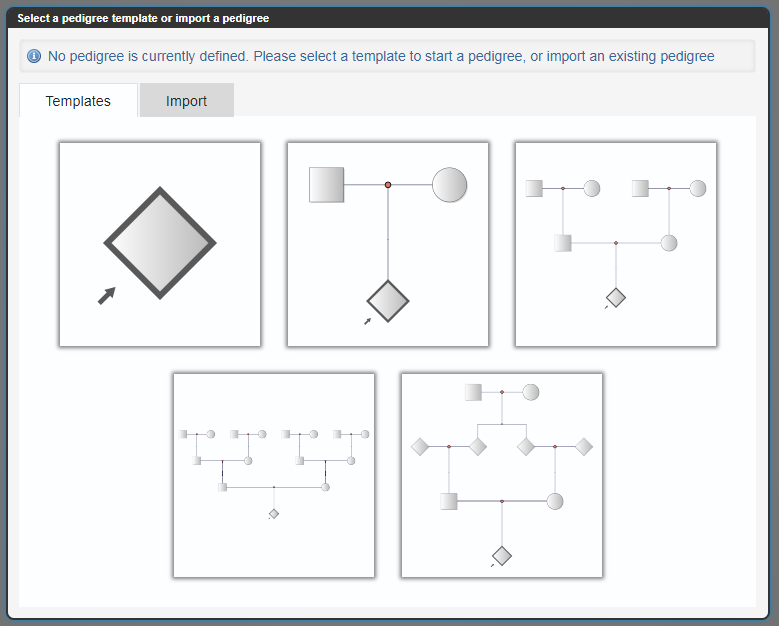 You can then close this browser window as the Pedigree Editor will still be open in a separate window in your browser. Continue to create records for all other family members in the same way. Once the pedigree is complete, click Save and then Close to return to the original index case record. If the person is an unaffected relation, please tick the This patient is clinically normal checkbox and move on to the next section. 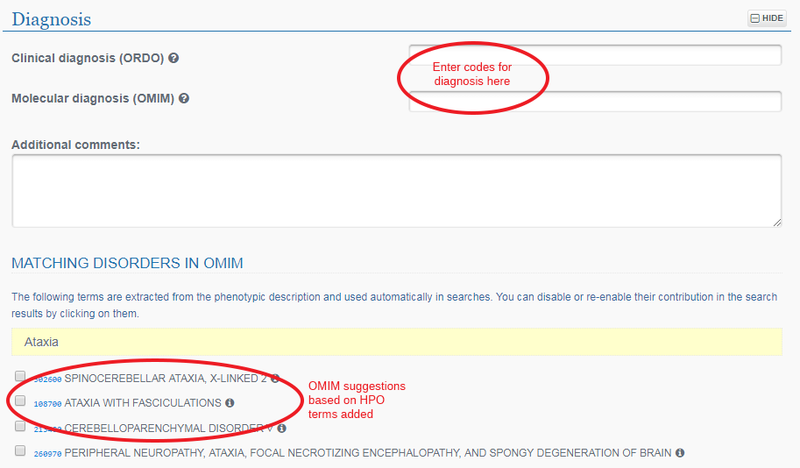 You may search for phenotypic information not included in the selected form by typing a feature in the Quick Phenotype Search box. Suggestions from the HPO ontology will appear and you can choose the most appropriate one. You can also browse the HPO terms in the form itself, clicking on a category to open up further choices, and the blue triangular symbols to expand the hierarchy of HPO terms further. The HPO terms listed here will vary depending on the Study you selected. By choosing “None” for Study when you create a new record, ALL HPO terms will be listed here. We ask that you submit a minimum of 5 HPO terms here, if possible, as any less renders the record less useful when using the analysis platform to compare and match cases. If the specifc HPO term you are willing to introduce does not appear in the browser selection, please go to https://hpo.jax.org/app/ to search for the most appropiate term. 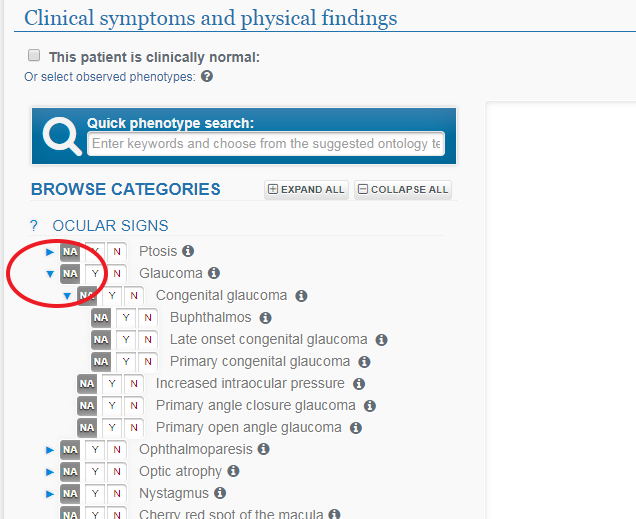 If the proper term is not listed in the ontology, you can still entering the symptom in “free text” selecting the last option of the dropdown in PhenoTips. In this case, we strongly recommend to propose a new term request to the HPO ontology by submiting an issue on HPO Github. 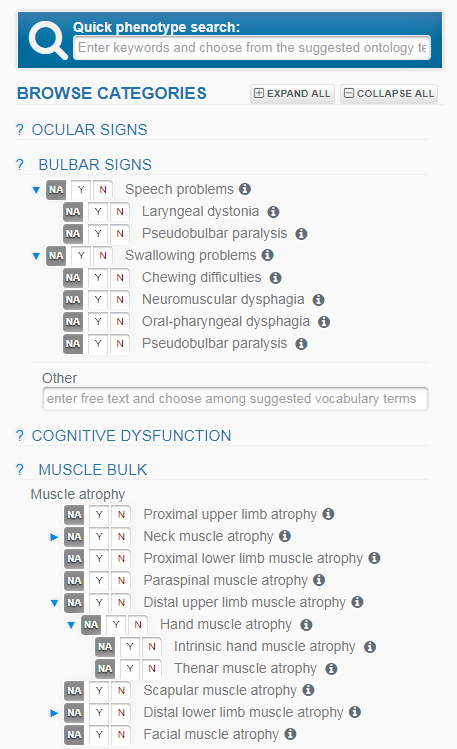 Under Diagnosis you can type in any confirmed diagnosis and choose from the pop-up OMIM descriptions. 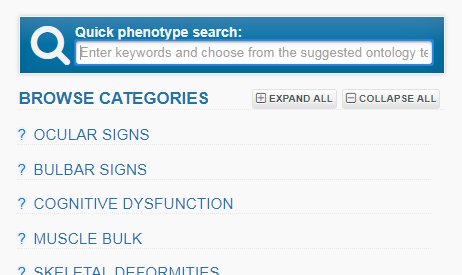 You may also select from the suggested diagnoses which have been generated based on your entered phenotype data. Click on the Save button at the very top of the page to save your record. This is very important as otherwise only you will be able to see record; not even other members of your team will be able to see it unless you do this. You now need to decide who can view/edit your record. At the top right of the form it will say, This case is owned by You and is Private. It is shared with No collaborators. Click on Modify permissions, next to this statement. 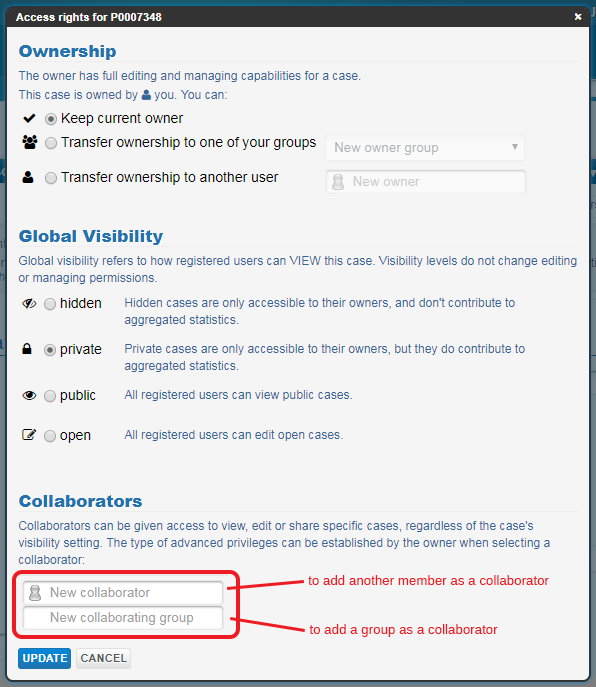 Leave Ownership and Global Visibility as they are (default is Private) but under Collaborators, you can type the name of another user or group into the relevant fields and select the appropriate pop-up. Please make sure to add your own group as a collaborator or they will not be able to see the record. Use the drop-down menu to give permission to those with whom you shared data to either view OR view and modify the record. 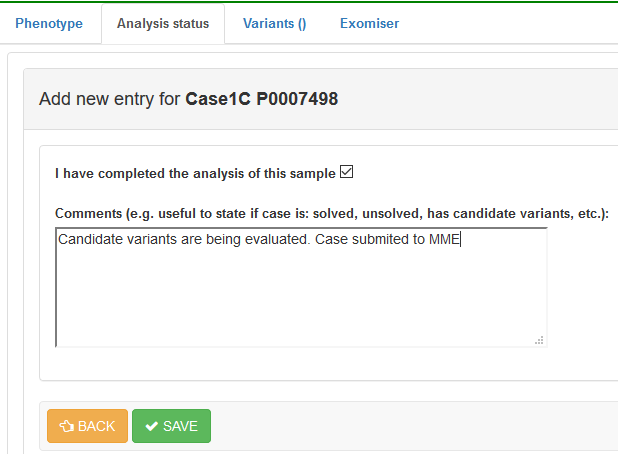 Once the case has been analysed through the RD-Connect Genome-Phenome Analysis Platform (https://platform.rd-connect.eu/genomics/ ), you can enter information concerning its resolution status (solved, unsolved or with candidate gene/variant(s) under functional studies). Save the record. You will be able to see and update this information at any time in this same section. 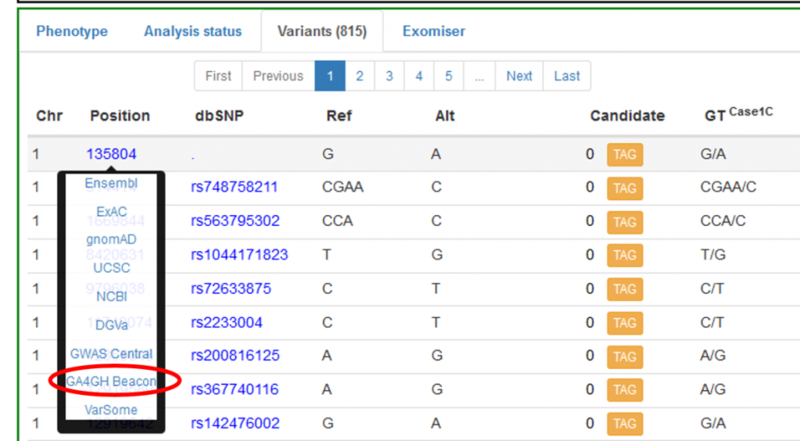 To identify and TAG the corresponding causative variant(s), you should go to the RD-Connect Genome-Phenome analysis platform (https://platform.rd-connect.eu/genomics/ ), and run the query with the addequate filters to get the causative variant(s) in the results section. We suggest to filter by the “gene name” to restrict the query; as you type a list of genes will appear for you to choose from. A form will appear with different dropdowns to fill in. We strongly recommend you to follow the ACMG standards and guidelines for the interpretation of sequence variants (PMID:25741868) and to fill in the clinical significance of the variant in the form. Intervar is a bioinformatics software tool for clinical interpretation of genetic variants by the ACMG/AMP 2015 guideline that might help you in this process (http://wintervar.wglab.org/). This information will be stored in the RD-Connect database and will be accessible through the data submission module. 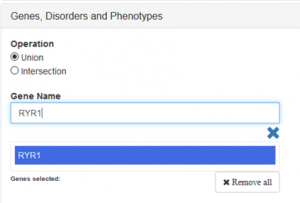 Go to PhenoTips, select the solved index case you want to update either by browsing all your patients or entering the corresponding PhenoTips ID in the search box. Open the DIAGNOSIS section to enter the corresponding OMIM and ORDO descriptions; as you type a list of terms will appear for you to choose from. Remember to save your changes before leaving the page. BEFORE STARTING THIS PROCESS ENSURE THAT YOU HAVE THE APPROPIATE PATIENT INFORMED CONSENT FOR DATA SHARING. 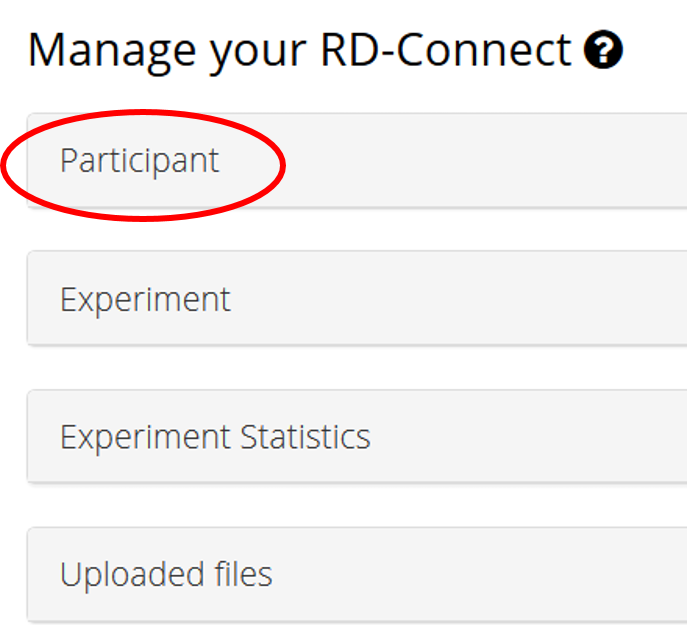 If you have not previously selected the patient as matchable during the submission data process please go the the RD-Connect data management module and change the participant MME status to matchable. 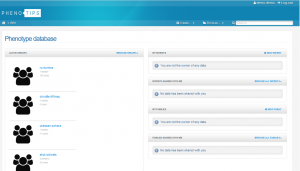 In the target endpoint section you will be able to select if you want to match your patient internally (within the RD-Connect database) or externally to the whole MME networks through PhenomeCentral. 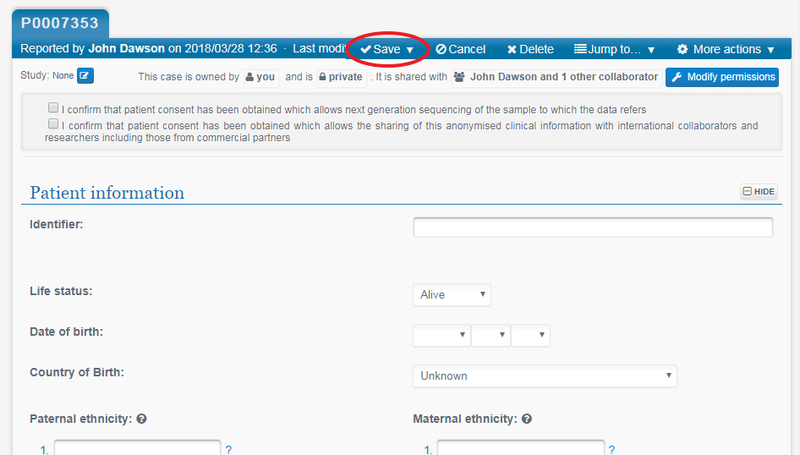 You can also add additional HPOs or gene by typping directly in the form. Once you have checked all the information, you can submit the data clicking in submit. The application will return the list of patients that matched your query ordered by MME score. MME score is defined from 0 to 1, being 1 a perfect match. This score is divided into two part 0.5 for the gene match and 0.5 for the phenotypic match. If you have a positive match and you want to contact the corresponding data owner, click to Initiate contact and an email will be send to you and the corresponding submitter to initiate a possible collaboration. 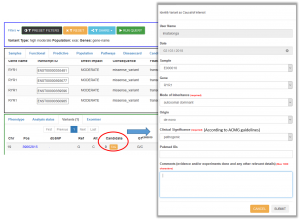 The Global Alliance for Genomics and Health’s “beacon” application programming interface has been implemented, which enables querying of the presence or absence of single variants in the RD-Connect cohort. This beacon is connected to the Beacon Network which is a search engine across the world’s public beacons. It enables global discovery of genetic mutations, federated across a large and growing network of shared genetic datasets. You can easily submit your variant of interest to the Beacon Network selecting GA4GH beacon at the chromosome position level from the results section of the RD-Connect GPAP .